One of my favourite parts of PC gaming is seeing modders push old game engines to their limits, by creating maps and levels that likely wouldn’t have been possible back when the game in question originally released. A quick glance at Half Life: Echoes immediately shows it is one such mod. 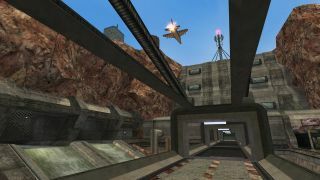 Created by first-time modder James Cockburn, Half Life: Echoes retells the story of Black Mesa’s alien outbreak from what the developer cryptically refers to as a “new perspective”. Elsewhere, on the mod's ModDB page, this new perspective is identified “Candidate 12”, another drone in Black Mesa's gigantic hive, at least until the Resonance Cascade. It’s a fitting theme for the mod, which basically aims to exaggerate all of the strongest elements of the original Half Life. Echoes comprises over thirty new maps, all designed solely by Cockburn. And they’re not small either. Take a look at the images below. Even considering how long in the tooth GoldSrc is looking today, that’s some mighty impressive map design. They’re so big that Cockburn recommends playing it on a fairly up-to-date PC, because the detail is such that it’ll cause slowdown on older machines. The mod has been in development for over four years, having been originally announced back in 2014. The response by users has been overwhelmingly enthusiastic. Echoes currently has a rating of 9.4 on ModDB, with one reviewer calling it a “modern-day masterpiece”. Below is a launch trailer which shows off some of the mod’s scripted events, including an impressive flyover of the Black Mesa area by a host of military aircraft, and an admittedly less impressive scene of a zombie throwing a barrel at the player. That said, I do now want to see a Half Life mod that retells the Black Mesa disaster from the perspective of Donkey Kong. Half Life: Echoes can be downloaded here, although be warned it’s designed specifically for the Steam version of the Half-Life, and isn’t compatible with either Half Life: Source or Half Life for Windows (if you somehow have the CD case from 1998 still hanging around). If you want to see more mods that do madly ambitious things with old game engines, you should check out the Forgotten Sepulcher, a ridiculously huge fan-made Quake level.